Ideas for stories can come from a variety of places. A cable television series inspired my new book. A friend of my wife, Jo Ann, gave me the seed of the idea for a movie script. Of course, not everything is about writing. As a kid, my friends and I drew on television shows and movies for game ideas. We played Poseidon Adventure after seeing the movie and re-enacted episodes of Combat until we knew them by heart. Then, recently, I learned of someone else who got ideas from a similar source. My brother-in-law, Dan, used to draw inspiration from the old Creature Feature programme. It ran on channel 44 WTOG-TV, Tampa, Florida, for a quarter century, from 1971 to 1995. For those too young to remember, the show and many from a similar mold, there was a very simple concept. Starting mostly in the mid-1970s, they featured a host. 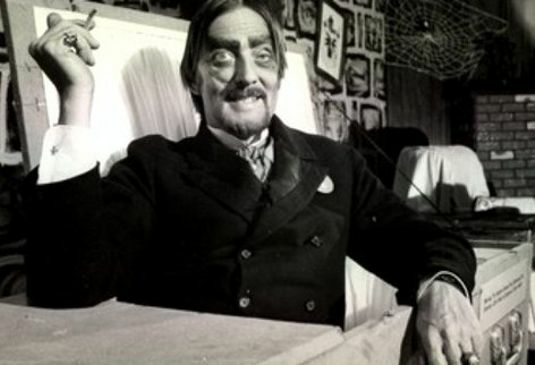 Ours was Dr Paul Bearer, a clear play on the term pallbearer. The show usually aired over the weekend because it appealed to children and teens. Our television Dr Paul Bearer, not the one that worked the WWE, would come on, make a few lame jokes and then introduce a “horrible old movie.” The films could be anything, often an old horror classic, which was in the public domain and thus cheap to buy. It might be a B-movie of the 40s, 50s, 60s or even the 70s, if it was cheap enough to air. I saw many good movies on the Paul Bearer show and quite a few bad ones. My dad and I watched them together and we often enjoyed the bad ones more than the good ones. We saw Curse of the Living Corpse,” which was the film debut of Roy Scheider, long before he did Jaws. Dr Bearer often played his Franken Steinway. Dr Bearer would always have some little skits. Sometimes he went up to the music room to play his Franken Steinway Piano and sing a song. He always did a wrap-up after the movie was over. He always invited us to come back next week. We did. As for my brother-in-law, Dan, he drew on those films for inspiration. After seeing one of those teen slasher movies, he slipped off to another room and called the house from the second phone. Back then, some landlines let you call your own number. Marie, his sister, answered the phone in the living room. Dan would whisper, “Are you alone in the house?” Just as had happened in the film they just saw. Her scream practically shattered every window in the house! Another time, he got a mask of an old man and had a friend wear it. One night, the friend marched up to the house while Jo Ann, then about twelve, was home alone. As it was Arcadia, Florida and a warm evening, the widows were open and only covered by screens. Pressing his hideous face against the glass, he said, “Hey, sweetie, you home alone?” The poor girl screamed to high heaven and ran from the room! Dan might have gotten away with that one, but he pressed his luck. Wearing the mask himself, he went up to the house of another friend. Her dad was home. He called the police and got his shotgun! Thanks Dan, for another great memory! Yeah, Dan got in trouble, but that barely put a damper on his antics. After all, there were plenty more “horrible old movies” to inspire him. Now, anytime I see a Roger Corman film or some other cheesy B-movie of my youth, I don’t merely enjoy it, I smile and think about what sort of mischief Dan would have done based on it.